1880, pine and pear wood, paulownia wood inlaid Chinese characters. 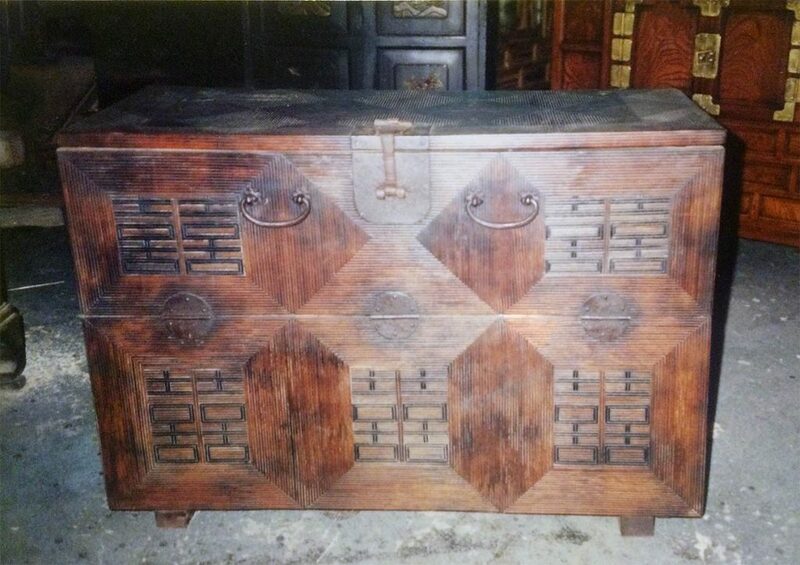 36″ w, 15.5 ” d, 25″ h.
This chest is made of pine inside and pear wood outside. The “Double Happiness” inlay is made of the dark grain of the paulownia wood. It was found on Kangwha Island after the Japanese Occupation by an esteemed American missionary doctor who went to the island to treat the sick and dying. This chest made with labor-intensive bamboo-like slats was likely made for some member of the royal family or high official sent into exile. It functions like a “bandaji” for storing clothing. It is in excellent condition and is certified by someone approved by the Korean government in the 1900s.